Visibility – Without a window, there is just a wall. Windows let you see through a solid surface, allowing you both pleasant views of the outdoors, and practical visibility. Whether you are enjoying the winter sunset from the warmth of your living room or spotting the garbage truck trundling down your street (so you can run your can out to the curb in your slippers). Whatever the case may be, windows ought to be transparent, crack-free and easy to see through. Many old windows are none of the above, but a new Crown Point window installation can help us fix that. Insulation – Out here in the Midwest, we’re used to cold weather in the winters and hot, dry summers. In both these cases, insulation is a huge factor for your home. When the winter winds come howling in from Lake Michigan, or a thick, humid heat settles over the region, you’ll want your windows to be sealed so that your air conditioning or heat is effective. And while modern technology has helped us create windows and doors that are better-sealed than ever before, old windows are often lacking in this department. Further, time takes its toll on window frames, eating through the original seal and creating frigid or stifling conditions within your home and blowing up your electric bill. Beauty – Old windows can be unattractive. While this is not always the case — and window maintenance and repair can go a long way to ensuring your home looks beautiful through the years — replacing your windows with a fresh Crown Point window installation will almost certainly increase your curb appeal. Old window styles often become outdated over the decades and may give your home a strange, stuffy appearance. On the other hand, new window design and installation can help you customize your house — adding full picture windows to the living room or small, cute frames to your attic. Whether seen from the outside or the inside, windows go a long way to ensure your home is the toast of the town! At Doppler, we will meet all your window needs with efficient and friendly service. We’ve been replacing windows, building fences and remodeling bathrooms — along with every other home and business improvement job imaginable — for three generations! We’re family-owned-and-operated, and we’re proud to be a part of the Northwest Indiana community. At Doppler, you’ll find a massive selection of double-hung windows, as well as other designs that will ignite your imagination. And while window replacement may be a tall task for anyone without experience in the field, Doppler is up for the job. Our Crown Point window installation services are second-to-none, and we’ve never had a complaint filed against us. With all this in mind, give us a call today! 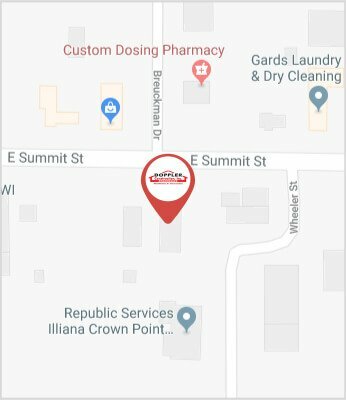 You can reach us at our Northwest Indiana office, or by clicking here and leaving us a message online. We’ll message you back or give you a call and get started on your Crown Point window installation immediately. You can expect increased insulation, visibility and beauty for your home in no time, with efficient and innovative window designs that capture the imagination and the heat! Give us a call today and get started!